PSNI Deputy Chief Constable Stephen Martin apologising on behalf of the organisation. THE POLICE SERVICE of Northern Ireland has apologised profusely after it was discovered that a number of “legacy” documents relating to killings in the 1990s weren’t given to Northern Ireland’s police ombudsman. The cases relate to attacks which all involve Loyalist paramilitaries, including the betting shop killings where five people were killed. On 5 February 1992, a mass shooting took place at the Sean Graham bookmakers on the Lower Ormeau Road in Belfast. Five civilians were killed: three men and two teenage boys, all of whom were Catholic. The UDA claimed responsibility for the attack. 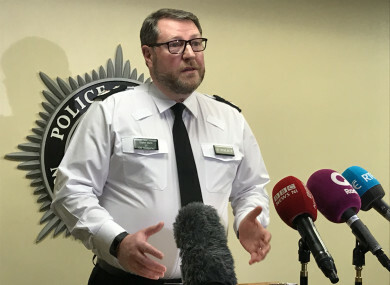 He said that the PSNI “never sought to deliberately withhold this information” from Office of the Police Ombudsman of Northern Ireland (PONI). Human error is being cited as one of the reasons for the failure to furnish the Police Ombudsman with all available information. Martin explained how the documents were omitted, saying that “a different researcher working elsewhere in the PSNI found the material while preparing for disclosure in response to civil litigation”. The fact that one part of the organisation was able to find the information while the other did not is a result of a number of issues including the differing levels of experience and knowledge of our researchers, the sheer volume of the material involved and the limitations of the archaic IT systems. The PSNI is estimated to hold over 44 million pages of paper and microform (microfiche and microfilm) related to cases. The material isn’t stored in one place, and is held on different technologies, some of which cannot transfer information to one another; there is no central reference or inventory for every piece of information. The Police Ombudsman Dr Michael Maguire told BBC News: “My staff became aware that police were preparing to disclose a range of material as part of impending civil proceedings. “Following a request from this office, police released this material to us, which helped identify significant evidence relevant to a number of our investigations. “Following on from this, police have now also identified a computer system, which they say had not been properly searched when responding to previous requests for information. In that instance, it would seem information which police told us did not exist has now been found,” Maguire said. As a statement of intent, I welcome the PSNI’s undertaking to address the issues which gave rise to the failure to disclose all relevant information to my Office. However, we need to explore with them how that will work in practice. We need to discuss with police issues such as resourcing, personnel, and knowledge of legacy police storage systems to determine a new set of working practices which will ensure that in future my investigators are able to access all the information they require. Martin said that: “We entirely agree with the Police Ombudsman, that the effective disclosure of information is central to any system for dealing with the past. The PSNI has decided that “the best interim solution for public confidence in policing would be to give appropriately vetted PONI staff full and unfettered access to our legacy systems”. Legal advice is being sought on how this would be carried out. Martin added that the police force “is committed to learning” from the incident, but it would need financial backing to implement any changes. Email “PSNI 'deeply sorry' for not giving documents relating to 1990s killings to ombudsman”. Feedback on “PSNI 'deeply sorry' for not giving documents relating to 1990s killings to ombudsman”.